Applications must be recieved by ICE no later than May 1st. “The requirements are simple — a hunger to learn and explore the arts and music, and a letter of recommendation from the student’s art, dance or music teacher,” says David Feder, ICE president. All Upper Keys high school students are eligible, including home-schooled students. Over its 23-year history, the annual Bay Jam Music Fest and ICE have awarded to date more than $350,000 in student scholarships and in-school program grants. Bay Jam was started by Judy Justice in 1993, the mother of a Coral Shores High School student. She was trying to lessen the impact of large state funding cutbacks to school art and music programs during the early-1990s. Several local musicians joined in her effort and Bay Jam, the art show/music fest, was born. David Feder, president of ICE which puts on Bay Jam, was in that first group of musicians. He recalls that he and many of his musician peers were the beneficiaries of a public education that years ago valued and adequately funded instruction in the arts. “But when the state started to strip funding, we saw Bay Jam as an opportunity to support local students and the future of the arts,” said Feder. 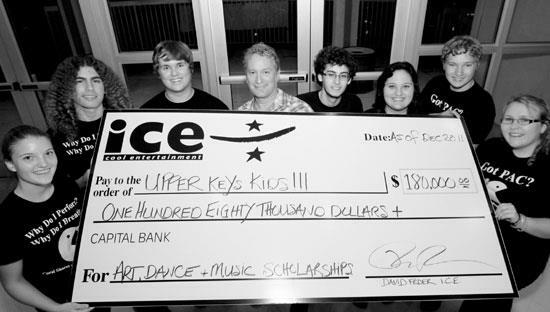 To high school students, these “Arts Enhancement Scholarships” can be a big deal – ICE Scholarships enable students to pursue explorations into the arts that may otherwise have been unaffordable. Some of our students do become professionals, and many have returned as young adults to enrich our community. But whether they become professionals or not, exposure to the arts and music enhances and broadens the lives of everyone.